As you know, I don’t feature much fiction or audiobooks on my site. However, Audible.com reached out to me about a new audiobook that sounds just too insane not to share! Seriously, buckle in because this is crazy! 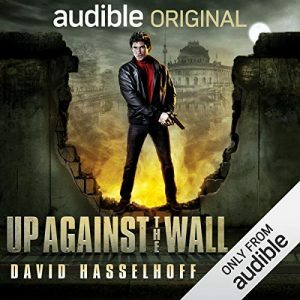 This month, Audible released David Hasselhoff’s UP AGAINST THE WALL, a cold-war alternate history written and performed by David Hasselhoff. The Audible Original production tells the secret history of the fall of the Berlin Wall, including CIA Agent Nick Harper, who is mistaken for American Superstar David Hasselhoff, while Hasselhoff is mistaken for Harper in turn, unwittingly finding himself caught up in a dangerous game of cat and mouse. Autumn, 1989. The waning days of the Cold War. A rogue Stasi colonel has acquired a nuclear bomb and threatens to level Berlin if and when the Wall comes down. CIA Agent Nick Harper is called in to foil the plot. Soon after arriving, however, Harper discovers his identity has been compromised. To stay alive, he must go along with a group of passionate young East Berliners who mistake him for their idol, American superstar David Hasselhoff. Meanwhile, across the Wall, the real David Hasselhoff arrives in West Berlin to play a sold-out show before a hundred thousand adoring German fans, in the name of freedom. But upon crossing into the East as a tourist, Hasselhoff – who bears a striking resemblance to the US operative – unwittingly finds himself caught up in a dangerous game of cat-and-mouse. When the Hoff fails to show up for his concert, Agent Harper is forced to stand in for his famous doppelgänger while the real Hasselhoff must rely on his acting chops and Knight Rider training to save Berlin…and potentially the world. Anyway, I know what you want now, and here it is, a link to audiobook on the site that features preview clips and even a short video! Click here!